An aspiring writer moves into a new apartment and discovers that her landlady has murdered her husband. Elsewhere, an accomplished surgeon is approached by a cabaret singer, whose beautiful appearance belies the grotesque condition of her heart. And while the surgeon's jealous lover vows to kill him, a violent envy also stirs in the soul of a lonely craftsman. Desire meets with impulse and erupts, attracting the attention of the surgeon's neighbor-who is drawn to a decaying residence that is now home to instruments of human torture. Murderers and mourners, mothers and children, lovers and innocent bystanders-their fates converge in an ominous and darkly beautiful web. 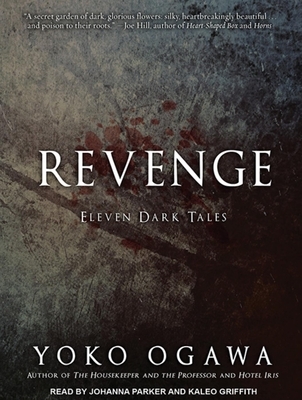 Yoko Ogawa's Revenge is a master class in the macabre that will haunt you to the very end. Yoko Ogawa is the award-winning author of more than twenty works of fiction and nonfiction, including "Hotel Iris," "The Gift of Numbers," and "The Diving Pool." Kaleo Griffith is a classically trained voice artist and actor living in Los Angeles. He has been called "powerful, with the presence of a young Timothy Dalton" by the "Hollywood Reporter." His various film and television credits include Oliver Stone's "Talk Radio," "Law & Order," "Diagnosis X," and "All My Children." Kaleo has won two prestigious "Audiofile" Earphones Awards. Johanna Parker, an "AudioFile" Earphones Award winner, has earned an esteemed Audie Award and three Audie nominations. She has received high praise for her work in all genres, including her portrayal of Sookie Stackhouse in Charlaine Harris's Southern Vampire Mysteries series (the source material for HBO's "True Blood").